I’ve been drawing mandalas for many, many years. Once it was a tool that helped focus me and bring me into a quiet and meditative space. Another time mandalas became a way of connecting with and working through my feelings in a troubled time. I kept a book filled with my intricate drawings for years until I felt it was time to let them go as I moved on with life. I thought my time with mandalas was done – I turned instead to doily making, a kind of crochet version of a mandala if you freestyle it and work with form and colour as your heart dictates. A thoroughly satisfying and restful occupation, mainly done during long winter evenings and eventually ending up, not with a book, but a blanket – a more cuddly and useful product formed from many hours of quiet contemplation. 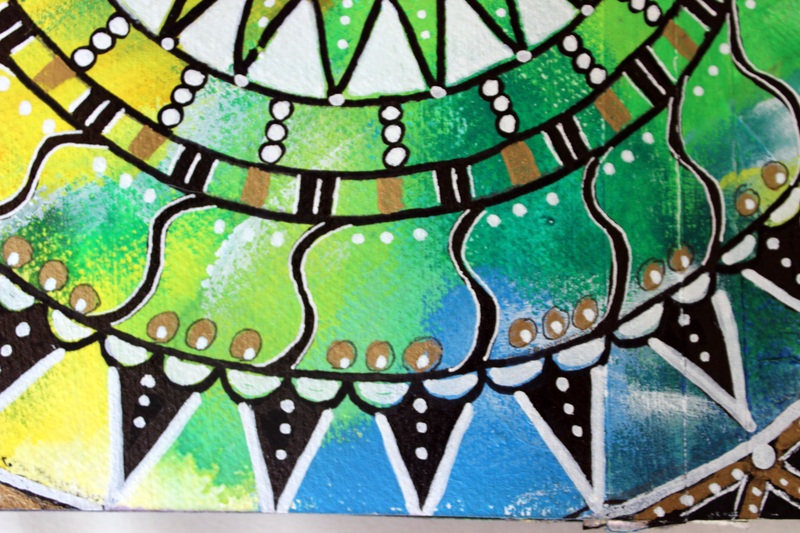 And then recently I fell somehow into the idea of painting little dream catchers – a version filled with doodles and shapes of a repetitive nature emulating the work of a mandala. Here are some I’ve been working on. They are not quite finished yet……. The process, if you are interested, was to lay down a mixture of colours over the entire double page spread. You see them now just as the background of the mandala. Then I used a circle template to pencil in three circles, the rest is done freehand. 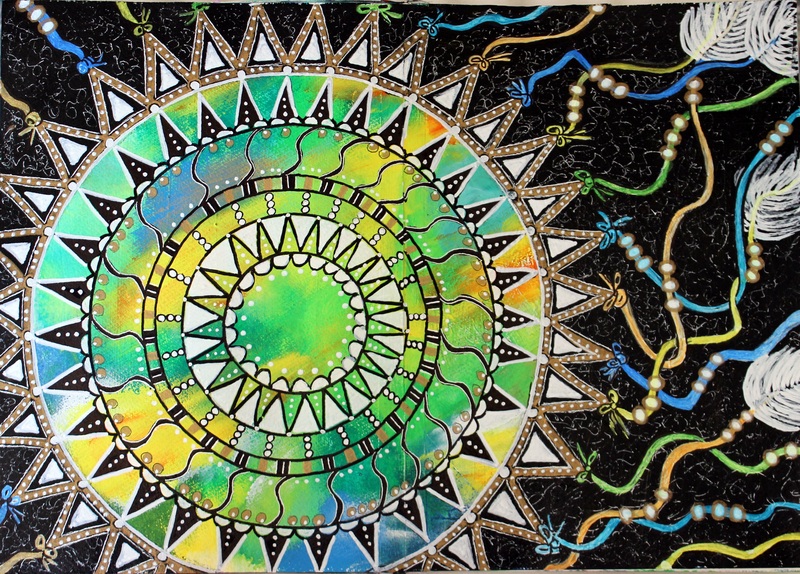 The mandala grew from the centre outwards, with lines and doodles and black, white and gold pens. When the sixth ring was completed the remaining page was painted black. When the black paint was dry I continued drawing and doodling the pointy outer shapes and finally the ribbons and feathers – at which point I realised my mandala had become a dream catcher. I felt the black was too heavy so finally I made lots of squiggly marks all over using a white gel pen. So, even though it’s not quite a mandala and not quite a dream catcher, it was a lot of fun to make! And it might make nice prints – what do you think? Finally, for his fans – here is Siddy this morning. Patiently waiting for Orlando to wake up and accept the toy that is being offered so they can play. He did wake up and Siddy did his happy dance, but Orlando didn’t want to play – again……. (sigh)………. This entry was posted in Creations From My Craft Room and tagged art journal, art journal page, dream catcher, mandala by thecontentedcrafter. Bookmark the permalink. And to think I’m 5-6 weeks late for the Dreamcatcher Queen. Well done, Pauline! I’ve been waiting for you Frank 🙂 At some point soon I really may prepare another post………. Pauline, I just heard about the earthquake and was worried for you. I hope you and your family are all safe. Btw, I thought you had stopped blogging as I hadn’t received any updates. I subscribed again, we’ll see if that fixes the problem but in the meantime I love both dreamcatchers and mandalas. yours are beautiful. You are a very talented artist. Lois, I’m so sorry I missed seeing this comment for some reason or other and left your kind thoughts hanging in the air. Lots has been going on here but all my folk are safe and well, thank you for asking. I’m being a tardy blogger lately, but hope to be back into the swing before too much longer. I hope you are well. No apologies necessary I was happy to see from the other comments that you were safe and that was the main reason I came checking up on you. Pauline, just read about the earthquake and tsunami in NZ. Are you and your family alright? I am hoping you haven’t been impacted by it all. Please let us know. We are all safe Maryann, thank you for asking. It was a rough night with evacuation for about three hours just in case – but no tsunami event this far south. Orlando and Siddy were surprisingly compliant about being swooped up in the middle of the night and bundled into the car for three plus hours. 🙂 My daughter in Wellington though was up all night with it, finding friends and dealing with some minor damage. I appreciate all the notes left via various media and will get back to you all when I’m a little more grounded. Hi Pauline. Just me checking in. Glad you are okay, and your daughter is, too. We didn’t need to leave home but I didn’t sleep well, all the same. Have you heard from Wendy at Quarteracre? Oh my dear – you are getting bombarded and rattled again! I hope you are coping okay with this latest onslaught – all the best for a good night’s sleep tonight! Yes, Wendy left a message earlier this evening, she didn’t say much but it is good to know she is okay. I am so looking forward to my bed. I have had the hot cocoa already. 🙂 Glad you have heard from Wendy. Thank you for taking the time to reply. I’m so glad you and yours are alright. I’ve been thinking of all of you, Pauline. Pauline, those ate Gorgeous!! I think they will suit cards, journal covers or prints, but I was interested to see the suggestion above that they might suit fabrics, too. I’m thinking quilt squares, especially, as they can be sewn onto bags or T-shirts or used to border a long. full skirt. Endless possibilities . . .
I’m glad to see they will make it to your shop soon, in any case. Have to run, now. All the best, as always, to you your companions and your family. Hi Linne, I am belatedly catching up on two comments that I missed altogether – one of them being yours. I’m so sorry for my tardy response! Thank you for your enthusiastic support toe the future of my work 🙂 who knows what might happen. I hope you are well and settled in your new home. Hello Pauline – I had to learn a bit about mandalas (thank you, Google): something representing the universe or the cosmos. Is that right? 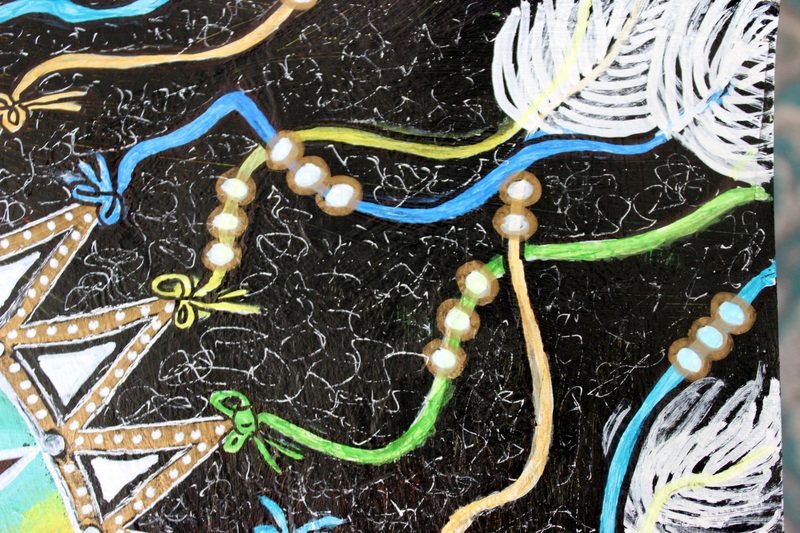 The green and black colors and detail are great! I’ve learned new today, AND had confirmed what I already knew: you are so talented! Thank you for coming by – it’s always lovely to read your comments 🙂 Have you never seen a proper mandala being made? Here is a link to something on Youtube. https://youtu.be/JdUFqkX2d6I I haven’t watched it yet, I chose it because it took place in North Carolina 🙂 Tibetan Monks create them painstakingly out of coloured sand and as soon as the mandala is complete it is wiped away – symbolic of both the impermanence of life and the practising of non-attachment. I went every day to watch one being built once, many years ago, and closely observed the monks at their work. It nearly broke my heart when the destroyed it……. It was a pivotal experience! Thank you so much Bekki! If I had a bigger place Siddy would definitely have a friend – wouldn’t that be fun!! I just can’t squeeze any more into my tiny house ……. sadly!! Hello hello Pauline! You’re probably at slumber, soon to wake for our skype session later 😀 Well for you, tommorrow morning. So I shall just tip toe round here for a poke about, LOL. Sometimes I use a heat tool to dry layers, other times I walk away – it depends where I a in the process. I always put my journal or work out on a book stand in the lounge and look at it as I do other things. The unexpected glimpse from a different angle often points the way ahead. Or other folk coming through saying something – very often Danella Joy makes a comment that breaks a stuck point. I find that really valuable. I’m lurking around here waiting for our Skype session to start – I think I was an hour too early today for some reason. Or possibly five hours too early – I just checked 😦 Later Tater!! I had the wrong time in my head on skyping too. LOL I dialed you at 3:30 pm MST because I thought that was it. Now I see it's 6pm my time, Monday evening….9AM NZ Tues Morning….almost there xoxox eeeeeek! so excited. Trouble it, it’s not 9 am here any more – when it is 5pm with Alys it will be 1 pm here and I have a doctor appointment half an hour later so I am going to miss it! So annoyed with myself for not checking before! When its not meant to be it’s not meant to be – sigh!! and so we had time together and it was awesome! 2018 !!! Hello Patti! It has been so long – it’s lovely to see you again and I hope all goes well with you! What beautiful work, Pauline. I’m always in awe of the way your mind works and the results that unfold. I love the four journal pieces and if prints are forthcoming, would love to order the purple one for a certain sister who loves both dream catchers and those colors. The black background does something magical to that piece. All those vibrant colors swirling about and then the offset. And those feathers! Oh. My. Goodness. Permanent colours sound like a plan to me. Why go to all that work and have it diluted. With watercolors there is an expectation of dilution and that’s what makes them look so ethereal. But with most other mediums, you want the color to stay put. I will stay tuned for future renditions. Lovely – and thank you for the inspiration to keep going with them! These are your best yet Pauline – I love them! They’d make great prints or I could see them as cards, fabric designs…their possibilities are endless. You should market them. I like the sweet look on Siddy, pleading for some attention. He seems to be patient with Orlando. Does he ever get right up next to him with his wiggly body? I remember when they slept in a photo. I think it’s more a case of Orlando being patient and forbearing with Siddy Robin. 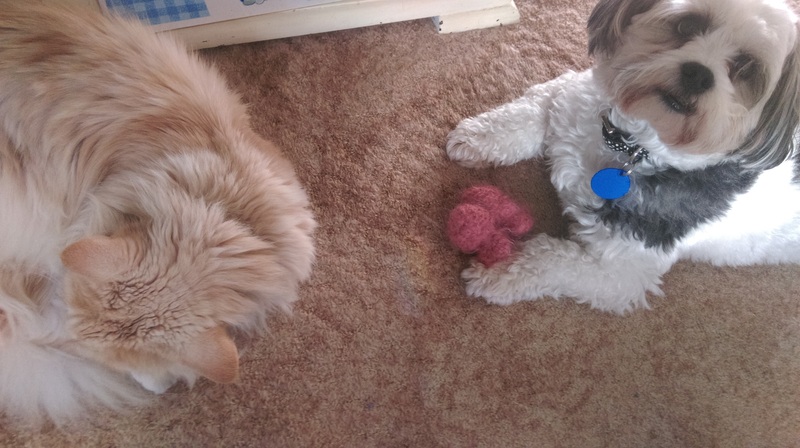 They sleep together quite often and sit on the back of my big chair to keep watch out the window in case anything untoward happens in the street……… Siddy loves his kitty, but he kitty just tolerates the puppy. Now and again there is a moment when O forgets himself and pats at him, this drives Siddy wild with delight and he dashes around in ever decreasing circles to entice the cat to do it again. The cat usually declines. If Orlando ever decided to play with him, Siddy would simply bounce to the ceiling with excitement. I do get a lot of laughs just watching them at their antics. It did take a while to complete this piece Robin, it just kept going and going and there always seemed to be something else to add in. It is a slow and meditative process. I’m glad you like it, thank you! I was happy you wrote out the antics of Siddy and Orlando. I thought O wasn’t keen on S but might warm up over time. The ever decreasing circles makes me smile very wide, Pauline! I shall read this to my Mom sometime next week. Pauline, I appreciate the warm best wishes, since even though its routine, I still haven’t had too many surgeries in my life! I should have listened to the world news, Pauline. I am trying to recuperate from our presidential election. So, only have listened to “local” news. What I am getting at is my distress to have heard about the New Zealand earthquake today! I was behind in this news. . . I feel relief reading your responses to others, now knowing you, Siddy, Orlando and your daughters are “fine and and dandy.” Thank God or Mother Nature! Hello Robin 🙂 It’s great not listening to the news isn’t it. I never listen, yet find myself informed on all the things I need to know about, without all the endless sound bites and fear mongering that goes on. Your election was an unbelievable event wasn’t it – It left us all with our mouths open asking how a bankrupt, megalomaniac celebrity with no political experience managed to do THAT!! I’m sending lots of wishes for peace and safety your way. Yes we are all fine and I am most grateful to be able to say that. The quake aftershocks continued on for three days coming every two minutes and with every hour holding about three moderates and two rattlers it was hard for those who bore the brunt. Some major roads are still impassable and one area is still cut off from the rest of the country. There was a US ship off shore somewhere and they came in and helped transport food and medical care into the Kaikoura area. Their help was much appreciated. I love your mandalas, Pauline. I say go for it you have such a creative talent and are so fortunate to be able to share it in so many unique and different ways. Your style is so you. I love seeing what you were up to. Thank you for sharing such detailed photos. They’re very enjoyable. Beautiful!! Thank you Jan, that is a very sweet comment to leave me with! I get lots of ideas from all over the place and then when I sit down to work they can get all muddled up in my mind and anything can happen. 🙂 I am so fortunate to have the time to play now! I am now enthralled with your dream catchers and the way you used acrylics or watercolors underneath.The way the colors melt into each other, blend and change seem to be the perfect background as a place to catch dreams. Thank you Ginene, I am so glad you had a close look. I use acrylics to paint with – I use my fingers quite often these days, or sponges sometimes. I think I did this background half brushes, half fingers. Fingers allow me to really understand how the paint is behaving on the paper and how it is mixing with other colours – it is a fun process and I never have any idea when I start, where it will end! P.S. Yes, they would make wonderful prints. I love these, Pauline. They have the outdoors shining through them, like a microcosm of the world. And the colors are so inviting. I like the detail on the feathers, too. Yes, make prints! Lovely, thank you Lisa! I shall away to the place that makes the scans and start the process! I love the journal piece especially Ms Pauline. There is something dynamic but wistful at the same time about it. Lovely work. That one in the journal….a daydream dandala, is what I call it…lovely, lovely, lovely. You dreamt upon it, and now I can dream upon it as I wander in and out of the spirit intricacies of color and shape. Put some on notecards, woman! Love the mandalas and dream catchers. I think they would make wonderful prints. Siddy is such a happy baby. You can see it in his little face. The picture of him and Orlando is precious. What a gorgeous combination of mandalas and dream catchers! I love the greens, blues and yellows over the black background, and also how you detailed it with the white gel pen and those tiny bows. Outstanding work, Pauline..and yes, they would make lovely prints. Your mandalas / dream catchers are gorgeous, Pauline. I like these a lot! I like everything about them–the shapes and colors, and the way they sound like such a pleasant exercise in losing oneself in the process. With this whole fad of adult coloring books, I have wondered why those same adults don’t just doodle and unleash their creativity. That’s what you’re doing and look at the fab results! I have several coloring books now, many of them gifts, but find that I too am easily bored. I keep one in the car, and was glad to have it last week when I forgot to bring a book and was bored with the options on my phone. It can be mindless and soothing to move your pencil about, but if I had your skills, I would be doing what you’re doing, making beautiful art. Beautifully, and intricately, decorative, Pauline. They would make nice prints – and greetings cards. Yes, I love the colours. I didn’t notice it was less finished than the others though. It looks just right to me! 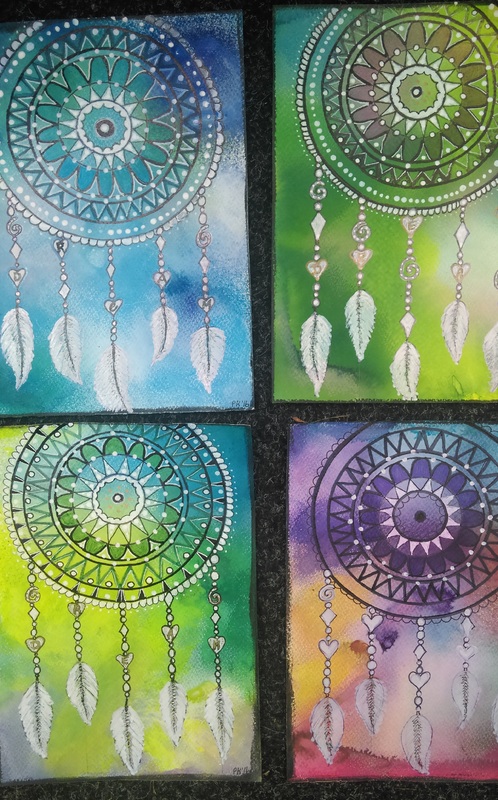 These are beautiful mandalas/dream catchers, Pauline! Can totally relate when you said that you never know what’s going to happen next with color on hand. 😀 With colors there is a world of difference and that colorful dream catcher is LOVE! They all remind me of the sparkling catchers you lovingly create. Well, thank you Carrie – I am very happy to receive this generous comment!! Beautiful pictures Pauline. They do look very like Dreamcatchers.